When you find yourself brave enough to delve into the world of fantasy fan-dom, you find out very quickly just how opinionated people can be about the vast mythologies they owe their allegiance to. You find that fanboys and girls get into the strangest and seemingly petty arguments about what should have happened when and who should have ended up with who. It can be quite a serious business, but every once in a while you find someone who is brave enough to find a way to make fun of all the ridiculousness. 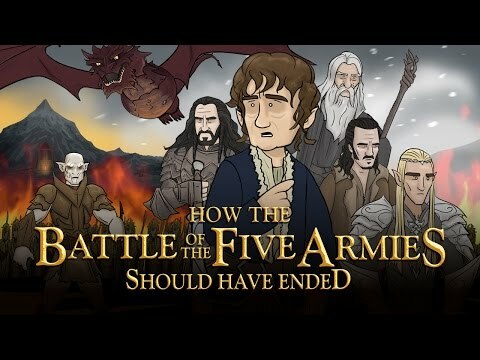 Instead the romantic and heroic albeit tragically sad ending of the last installment of Peter Jackson’s Hobbit trilogy, The Battle of the Five Armies, this wonderfully hilarious cartoon puts into perspective how a little bit of foresight and a bit more thoughtfulness could have saved not only a lot of headache, but also a lot of lives. Of course, for the sake of narrative interest and dramatic effect, this ending would never have been considered, if only to be in keeping with the film series obligatory super long running time… but its still a fun little thought.